Over the next three years, the ’Esvagt Bergen’ and the ‘Esvagt Stavanger’ will be servicing Equinor in the southern part of the Norwegian sector. An increased oil & gas production in the Arctic regions requires shipping companies with specialized competences. ESVAGT sees growth opportunities. NAME GIVING: Hess and ESVAGT add to their 19-year long collaboration with a new top modern multirole vessel, which appropriately was christened 'Esvagt Innovator'. ESVAGT will continue to be provider of guard vessel duty and standby preparedness on the Yme field in the Norwegian sector. ESVAGT's new, ultramodern MRV, the 'Esvagt Innovator', enters into contract for Hess on the South Arne field in July. The latest two new builds for, respectively, the offshore wind and oil and gas sector brings the ESVAGT fleet up to 43 vessels. ESVAGT, the dedicated provider of safety and support at sea, has appointed Jakob Thomasen as Chairman with effect from May 1, 2018. H-053 has been launched – still ahead are 3 months of work to ready the vessel for its 12 year contract in the South Arne field. After focused efforts, ESVAGT is now strongly established in the British sector of the North Sea, where the shipping company now has 14 vessels on contract. A new agreement with Petrofac strengthens ESVAGT’s presence in the highly competitive UK production market. Colleagues onboard the ’Esvagt Server’ can hold their heads high after completing a rig move of the ’Crossway Eagle’, a jack-up accommodation platform for Maersk Oil in the Danish sector. HST 780 – ESVAGT’s coming crew change vessel – has been launched at the Zamakone shipyard in Bilbao. For the first time since its delivery from the Zamakone Ship Yard in Spain in 2012, the ’Esvagt Aurora’ returned to dry dock at the end of April for a special survey. 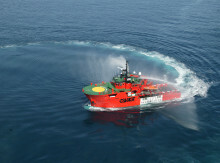 Purpose built ESVAGT vessel to perform additional tasks for Hess at the South Arne field. Every year, ESVAGT and DONG hold a combined exercise to ensure that their oil spill contingency plans function as intended. The ’Esvagt Aurora’ assisted in the transfer of the first oil produced in the Barents Sea. Revenue for the ESVAGT Group in 2015 was DKK 1,002.8m against DKK 946.5m in 2014. EBITDA for the year is DKK 435m compared to DKK 417m in 2014. ESVAGT delivers new record breaking result. With the refurbishment of the ’Esvagt Preserver’, five of ESVAGT’s eight group 3 vessels have received an extensive life-extension refit at the shipyard in Søby. The ’Esvagt Preserver’ is the latest of the group 3 vessels to be given a life-extending update. The ’Esvagt Beta’ was visited by the Minister for Energy, Supply and Climate, Lars Chr. Lilleholt.